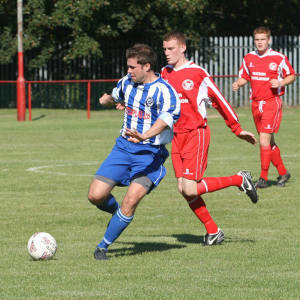 Penicuik travelled to Perth for the third league match of the campaign against Kinnoull in perfect playing conditions, and the crowd was served up some great football by both sides. The game started with both sides evenly matched and the first opportunity fell to Kinnoull in the 5th minute, but McKinlay dragged his shot wide of the target. Penicuik gradually began to control play and in the 20th minute Harvey should have scored with only Bruce to beat, but the keeper pulled off an excellent save. One minute later, Bruce rushed from goal to smother the ball at the feet of Cole. Then another won on one between Harvey and Bruce ended with another great save by Bruce. 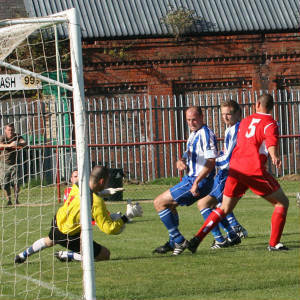 Penicuik’s pressure finally paid off in the 23rd minute when a partially cleared Penicuik free kick fell to KELLY. His shot beat Bruce, hit the underside of the crossbar and the ball bounced over the line before being hooked clear. Five minutes later, a long ball from the Kinnoull defence caught out the Penicuik defence, and with keeper Bald stranded out of goal, Duigan sliced his shot wide of the target. In injury time, McAllister picked out McManus who looked suspiciously offside, but Bald pulled off a great save to turn his shot past the post. Kinnoull came out for the second half with all guns blazing and in the 51st minute Bald did exceptionally well to cut out a dangerous low cross into the six-yard box. At the other end, a neat one two between Harvey and Barr saw Bruce rush from goal to deny the midfielder. Minutes later, Walker showed delightful skills to chip the ball over his marker only to see his strike scrape past the post with Bruce looking on anxiously. On the hour mark, Kinnoull had the ball in the net but Kelly was correctly ruled offside. Kinnoull eventually got the reward for their pressure when McALLISTER slammed home from the edge of the box in the 63rd minute. 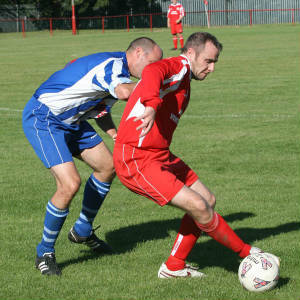 Two minutes later, Bald was at full stretch to turn a shot by substitute Anton round the post. Minutes later, Kinnoull’s McKinlay was red carded for a bad tackle on Gallagher. 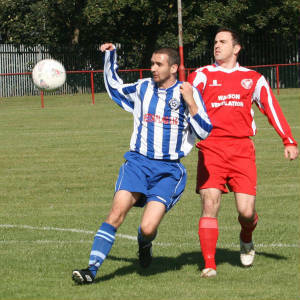 The sending off took the wind out of Kinnoull’s sails and Penicuik got back into the game. In the 84th minute HARVEY got in front of his marker to head home a Walker corner kick. Into injury time, and with Kinnoull pressing for the equaliser, their defence was posted missing twice when, first Walker broke free only for Bruce to bring off the save of the match. Then Noon only had Bruce to beat, but again the keeper kept Kinnoull in the game. In the 93rd minute, a defence splitting pass picked out McMANUS who did not hesitate and stroked the ball past Bald for the equaliser. 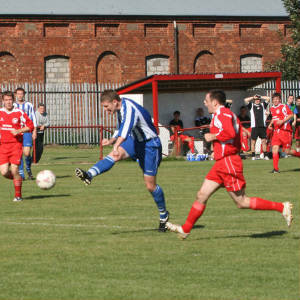 If Penicuik had taken their chances, they would have won the game handsomely, but consequently threw away two points.